The overall purpose of this learning pathway is to publish a storyboard for a subsection of a course you are developing. 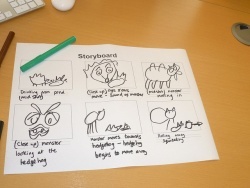 Learn about storyboarding as an approach for providing a high level visualisation for the design of an online learning sequence. Select a technology for publishing your storyboard online. Structure two learning sequences depicting the sequence of learning outcomes, assessment and online learning activities. Complete a learning challenge to publish your draft storyboard online with opportunities for cooperative feedback from participants in this course.